We’ll start with the bad news: the list of animated short films that will be taken to the next round of voting for the Oscars has been announced and Le Gouffre isn’t part of it. You can click here to see the films that have been selected. Congratulations to the teams behind these shorts, the competition was very strong this year and we can’t wait to see who will be nominated! Now for the good news: Le Gouffre has won the Audience Favorite Award at the SPASM Festival on October 24th! Thanks to everyone who voted for us! The film has also been selected to take part in the Festival du Film Court de Mont-Tremblant 2014! 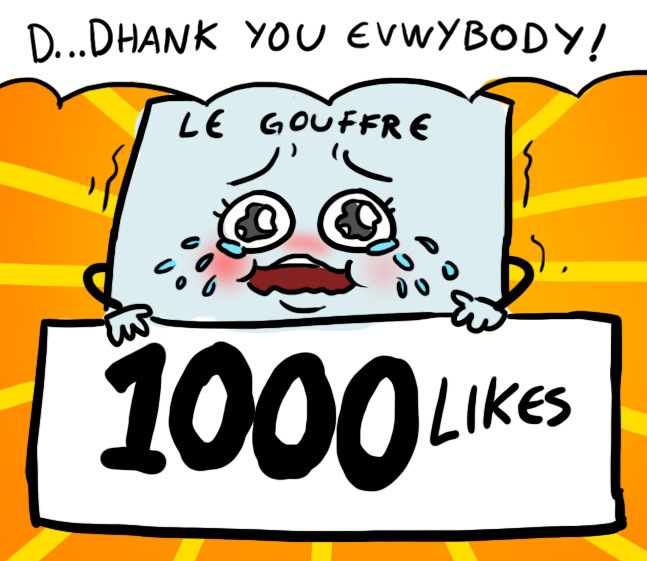 And finally, we have just reached a thousand subscribers to our Facebook page! This is an important milestone for us, and we feel very lucky to have all of your support.